Paul Dano’s directorial debut is also his screenwriting debut, pairing up with girlfriend Zoe Kazan to adapt this book and bring it to life right in time for Oscar season. Kazan has previously written Ruby Sparks, an original, and an excellent film as well, in which she delivers an excellent performance. But the pair have never written together, Dano has never directed, and so Wildlife would mark a major step forward toward awards and recognition. They chose a leading duo wisely, Mulligan & Gyllenhaal, two phenomenal actors who, now in the heart of their 30s, have mastered their craft. And Oxenbould as a vehicle for audiences is a smart choice as well, allowing us to enter into the plot and to witness events through his eyes. Wildlife is still, however, an amateur attempt, and it shows, resulting in a film that’s a great start but not perhaps the debut sensation we were hoping to see. 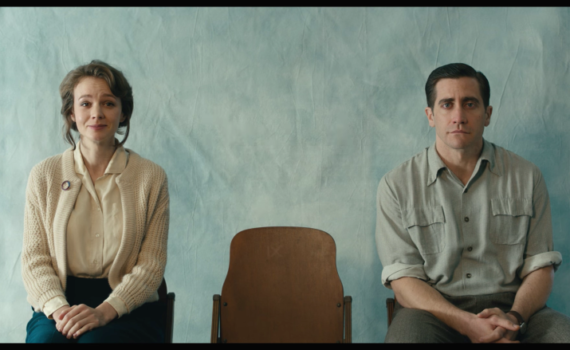 Based on the novel by the same name, Wildlife is a story of disenchantment and decay, of a marriage collapsing and its eyewitness the one person hurt most by its fall. The year is 1960, and the Brinson family has just moved to Montana for work. Jerry works at a golf course, Jeanette stays at home, and Joe is a teenager starting at a new school. When overzealous Jerry gets fired from his job, the family dynamic changes, with Jean looking for work and even Joe pitching in. Jerry’s masculinity is threatened, and he takes work fighting a fire in the mountains, a gig that seems more like abandonment then vocation. Jean begins seeing another man, and Joe watches it all as he tries to keep his own life in some semblance of order. Oxenbould is Australian, Mulligan is English, and Gyllenhaal is from LA, so each of them has work to do to fit the role of a Northwest family constantly on the move throughout the States, and none of them do the job particularly well. Each tries a specific accent/pattern/affectation and it’s fine if you don’t notice that type of thing, but I do, so it’s something that bothered me slightly throughout the film. And that wasn’t the only problem I had with Wildlife. The pacing was very poor, sleepy at times, and not enough happened in general, there weren’t enough elements for me to latch onto to really feel invested in what I was watching. On the positive side, all the actors performed admirably, no one stuck out as weak, and I was fascinated watching each one’s flaws and how they contributed to the inevitable end. I simply can’t say that I loved this film or that I was stunned by Dano’s & Kazan’s creation, especially since I came in with high expectations. The result was rather more mediocre than I wanted it to be, a well-crafted movie that offered me very little that was either remarkable or memorable.